Shows advanced information on your vehicle’s external display (2007 models only). A 4 x 50W power amplifier is integrated in the product, enabling superior sound and sufficient headroom for dynamic sound reproduction. New compressed audio format delivers unprecedented quality sound with smaller file size. Advanced technologies and functions that provide the equivalent of a highly sophisticated digital signal processor right in the head unit. 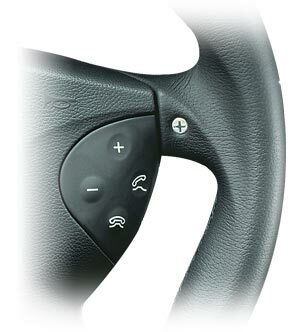 Fully wireless, hands-free connection between your Bluetooth enabled cell phone and an Alpine Head Unit. Dolby Digital delivers high-quality 5.1 multi-channel audio for surround sound content in movies and videos. These new multi-channel formats (5.1 and 6.1) deliver greater realism, audio fidelity (up to 24-bit/192kHz and clarity, with each instrument or vocal in its own separate sonic space. Alpine is ready for iPod® / iPhone®. Bring your favourite music collection to your car, and hear it as you want it to be heard – with exceptional clarity, extended dynamic range and full power. Another great qualityboosting Alpine technology. Included on a variety of head units, it gives you selectable expansion modes for MP3, CD, DVD and FM that restore quality lost in recording/transmission. The MP3 Compatible head units let you play CDs that you've burned with MP3 tracks. You can get 12 hours of music on a single disc. Models with MediaXpander™ enhance the MPEG compression for the full digital quality you expect. Sophisticated and ultra-precise digital map database, for the most reliable road guidance. The unit is compatible with steering wheel remote control systems so it can replace the factory-installed head unit without loss of this convenient option. Additional parts required ! Wherever you drive, count on the advanced TMC (Traffic Message Channel) system to steer you clear of unexpected traffic jams and adverse road conditions. We’ve got the widest coverage available — all ten TMC service countries in Europe — giving you timely and automatic alerts when traffic problems happen along your route. The display indicates both road section highlights and a comprehensive list for accidents and trouble spots. A USB extension cable is included to route the connector to a convenient location such as the glove box or the center console. Simple, fast and convenient. Your favourite digital music in your car – with Alpine sound. Devices with this feature lets you play back CDs you've burned with Windows Media Audio tracks. This popular compressed format let you keep an enormous amount of music on a single CD. Models with MediaXpander™ let you enhance and restore the sound for full quality. 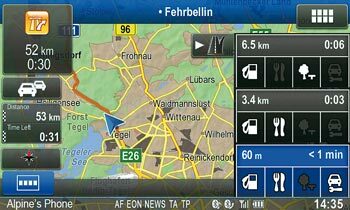 One Look Navi: navigation, entertainment and safety perfectly integrated. 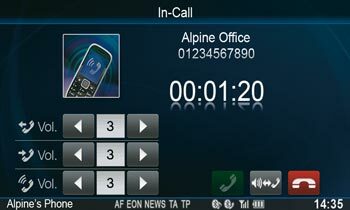 Alpine′s revolutionary One Look Navi concept makes using your system much easier and more efficient. The all-new premium INE-W977BT offers a brilliant 7” WVGA screen that can be fully detached from the product to prevent theft, as well as an optical output to connect it to the PXA-H800 sound processor. 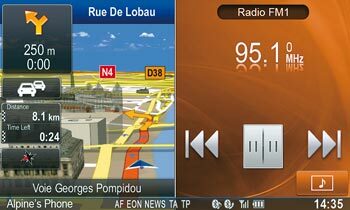 The unique 50/50 split screen puts twice as much information on the display, for more convenient operation of your navigation system and iPhone/iPod, Bluetooth, DVD and USB devices. The INE-W977BTcombines the best of Alpine′s new technologies for outstanding operation, guidance and safety. The new 7” detachable screen, huge map coverage, wide media compatibility, customisable user interface and excellent sound quality and extensive sound tuning features make this a must-have model. The INE-W977BT presents an entirely new level of user-friendly operation by giving you the choice of viewing two sources at the same time. You don’t have to go back and forth between two screens, selecting different menus. All the information you want is right in front of you. Simple touch screen icons and customisable functions add to the convenience. My Favourites lets you put eight frequent actions on one screen for one-touch selection, and arrange the layout the way you want it by dragging icons. Tune in your favourite radio stations, search your favourite POI categories, or call your favourite people without scrolling through the phone book. You can also select the background colour and match audio settings to your car model. And all this works for two people, based on Bluetooth phone recognition. No matter what media you want to enjoy, the INE-W977BT is ready. It provides music and video playback from your iPhone/iPod, USB sticks and a DVD player (DVD-Video/CD/DivX/MP3/WMA/AAC). Videos look great on the 7” WVGA display with Visual EQ mode selection. You can also stream music via the built-in Bluetooth module. Sound customising functions include MediaXpander, 6-Channel Time Correction, Preset Equaliser (10 modes) and 9-band EQ. 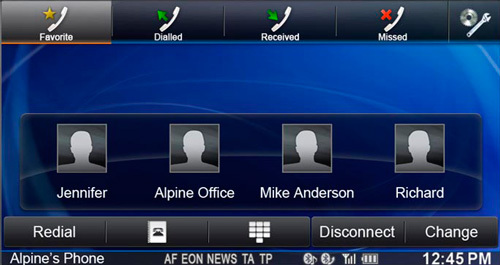 Alpine makes it easy to integrate the INE-W977R with the factory system in your car. We have interfaces that let you operate functions via the steering wheel remote control and use a sub-display to view information from the head unit on the gauges. It’s all part of the One Look Navi concept aimed at letting you keep your eyes on the road. With the new iGO Primo 2 software, using a navigation system has never been so easy and convenient, thanks to its wide range of very helpful functions. The INE-W977BT gives you wide map coverage of almost all European countries, support for maps with 3D landmarks and 3D city models, highway mode, advanced address input and other sophisticated features. And of course, the 50/50 split screen function lets you view and control a navigation screen and another screen such as music with just One Look. This Advanced Navi Station has everything you need, no matter what countries you travel in. It covers 47 Western and Eastern European countries with 29 languages for voice guidance and Text-To-Speech in 15 languages. Its enhanced POI database makes it easy to find your favourite places and to explore new areas you have never been to. It also provides a TMC tuner that always keeps you on the route with the least traffic activity. You can input postal codes for all European countries, including 7-digit UK codes, which makes searching for addresses quicker. The system even reads partial addresses. Select your own language from 33 different keypads, including Cyrillic, Hebrew and Greek. In addition to keeping you informed and entertained, Alpine wants to improve your safety. 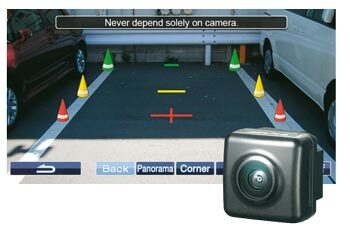 The One Look Safety features include Advanced Bluetooth capabilities, rear view camera support and the fully detachable display, and are designed for safer driving and to protect your system. The high-resolution 7” screen can be fully detached to prevent theft of the unit. An included soft-pouch ensures that the display can be stored safely when you take it with you out of the car. Detaching the display is fast and easy. You can pair a total of 5 phones with the INE-W977BT. 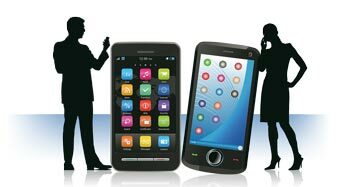 You can even stream music from one phone while making hands-free calls with another at the same time. Set your 4 most frequent called numbers for easy One Look access in the speed dial screen.